Maqsina Hair Oil is Prepared from Extract of the Herbs and Base of Olive Oil, Til Oil & Almond Oil, Which Provide a Light, Non-sticky Hair. 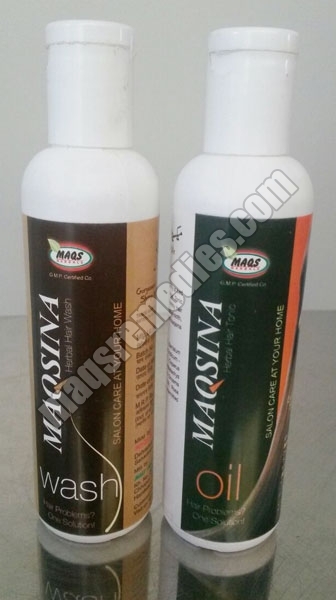 It Provides the Nourishment and Smoothes Hair Cuticles with the Goodness Herbs.maqsina Hair Oil Has Vitamins & Minerals Absorbed By the Hair Helps Maintain the Moisture Thus Leaving Your Hair Incredibly Fresh, Makes Hair Long, Prevents Split Ends, Controls Hair Fall,Strong & Thick, Soft While Naturally Bringing Out the Beauty of Hair. Its Hairfall Therapy Oil. use Maqsina Hair Oil At Night.shampooing It with Maqsina Hair Wash to Moisturise and Nourish Hair, Giving It a Long Lasting Healthy & Shiny Hair. Uses : Apply to Scalp with Finger Tips Gently At Bed Time or Any Convenient Time.or as Directed By the Physician.